Because I was a classroom teacher, reading specialist, Title I/gifted teacher, elementary supervisor, and college instructor in Language Arts, I especially enjoy coming back to schools to share the delights and hard work of being an author! Children are surprised to learn how long it takes to write a book with only 19 words in it, how much research is involved to do a 32 page book for sixth graders on Ancient Egypt, or that ideas can be found in their back yard, in the cafeteria, or sitting right next to them on the bus. Having been a teacher, I know you can’t just talk at kids. They need to participate. My basic program is an interactive assembly. Children form a poetry troupe on the spot and perform poems. Faculty, staff members, and the entire audience also join in with chorale speaking. The assemblies include a PowerPoint slide presentation which emphasizes the importance of reading, where ideas come from, the making of multiple rough drafts, the patience and persistence involved in being an author. Research strategies, involvement with illustrators, use of pertinent details, the importance of setting, development of character, point of view, and problems with plot are included. 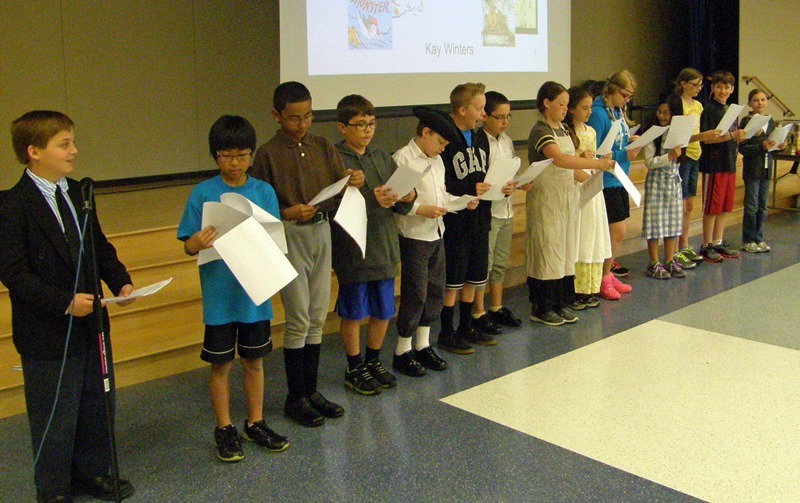 In some schools where Colonial America, Ancient Egypt, or the Oregon Trail are in the curriculum, I send, upon request, a script for students to prepare a readers theater, which becomes a part of the program. Go to Author Visit Scenes to see some other examples of how the program involves children, faculty, and staff. I do three programs a day. Because of the interactive nature of the program, I find it works best to have some children who can read in each assembly. Students get the most out of the program when they have been introduced to my books in advance. Due to the economic downturn, I have lowered my fees. For visits not requiring an overnight stay, my fee is $1000 for a full day - three presentations plus book signing - with no mileage charges. If overnight, my fee is $1200 plus transportation. Fees for visits outside the US will be negotiated. Contact me at authorK@aol.com if you are interested in discussing a visit to your school. Arrive at 8:30 to set up. Meet with custodian, librarian, gym teacher and/or others familiar with the lights, electrical service, and operation of audio and video equipment in the presentation room. Second Assembly: 10: 20- 11:10. Lunch: In some schools the PTA organizes a covered dish for the faculty, and we have an opportunity to get acquainted.. In some schools, we go out. In other schools I eat in the library with the librarian or the reading specialist. Whatever works best for you. Book signing should be done in a quiet place without the children. Cart for my projector and laptop. We can/will use local equipment when it is available and when someone knowledgeable about its use is present to assist us. Microphone(s). Regardless of the assembly location, a microphone is not optional. Since I involve children and staff in my interactive programs, what works best for me is to have two available; one a clip-on (if possible) and the other a hand-held (long cord or cordless). Youngsters get the most out of the author visit when they have been prepared. The process is similar to preparing children for a field trip. When they are familiar with my books, they become really engaged. It is important for the visit organizer/coordinator, whether PTA or school staff member, to work with the librarian, reading teacher, and class room teachers to introduce the children to my books well before the visit. Sometimes,, classes will have done projects related to the books. A wonderful resource for schools planning author visits is a book called Terrific Connections with Authors, Illustrators, Storytellers: Real Space and Virtual Links by Toni Buzzeo and Jane Kurtz. This book can help you create a super author visit, one that teachers and children will long remember. This inspiring guide is available from Libraries Unlimited - 1-800-237-6124. "Kay Winters' visit to our school was a valuable learning experience!. She awed each of her audiences with her personal and professional stories. Students were left with an understanding of how moments from their lives and simple observations can lead to a wonderful story. Mrs. Winters was engaging, energetic, charming and fun! I could have sat and listened to her all day long. I am excited for her to return to our school in the future." Jonathan Graf, Principal, EMC Elementary School, Souderton Area School District, PA.
"We SO enjoyed our visit and time with Mrs. Kay Winters. She was so real with our students and teachers - no airs put on. The stories and experiences that she shared were inspirational and motivating. Our teachers and parents said she was the best visiting author we have ever had. Her program definitely proved to be of exceptional value to our entire student body and staff. Thanks, Kay, for such a memorable event." Mrs. Leanna Martin, Title I Teacher, Addaville Elementary School, Gallipolis, OH. "Kay Winters recently visited our elementary schools and presented one of the most valuable assemblies that I have seen done by a children's author. Clearly, her experience as an elementary teacher helped to guide the way the assembly was carefully planned. She held the children's attention for nearly an hour, involving them in sharing her literature. I especially liked the way Kay showed students how revising is such an important part of her craft and how a story can evolve from a relatively short experience. Thank you, Kay!" Jeanne Herr Cassidy, Elementary Reading Specialist, Elizabethtown Area School District, PA.
"What a time we all had!!! You certainly were amazing with everyone as you got them all involved. The principal, teachers, and students loved participating in the presentations. Everyone is still talking about how well prepared and effective you were throughout the presentations. The subject matters were all things that children were able to relate to or wanted to know more about and you certainly catered to both. Your warm personality and your sharing experiences and background allowed them to see you as a real person as well as a famous author. Thank you so much for feeding the student's minds and their spirits." Mrs. Betty Myers, Library Media Specialist, Myers Elementary School, Cheltenham Twp., PA.
"Thank you for celebrating our annual Young Authors' Day at Triangle School. You were energetic and engaging. The students loved being a part of your presentation. We had a terrific day as we celebrated WRITING! Thank you for helping us create memories for our students that will last a lifetime!". Grace Verano, Writing Teacher, Triangle School, Hillsborough, NJ. "Mrs. Winters shared with us her story of becoming a writer. We learned how the magic of books, wonderful teachers, and rich experiences early in her life led her to find a voice of her own - as an author, and now, lover of history. 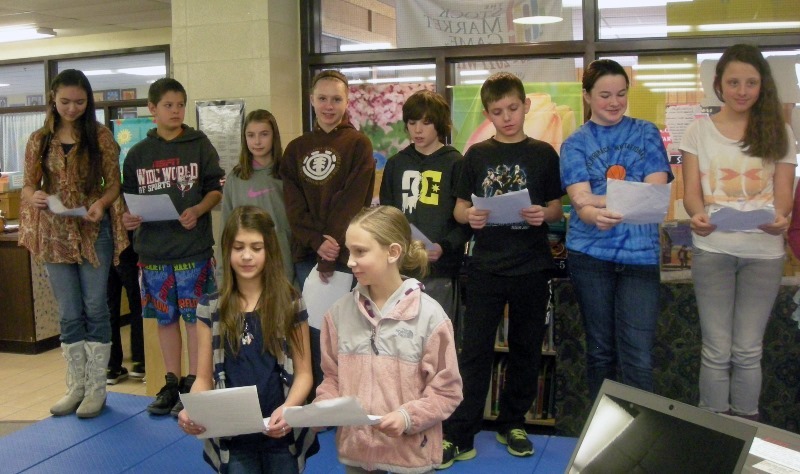 Eager to share their own love of reading, our students jumped at the chance to read Mrs. Winters' poetry and to become characters and voices from ancient Egypt and colonial America... and the students loved it. In the spirit and sincerity of a benediction, Mrs. Winters encouraged the children to read, write and find their own voices, just as she had done when she was their age. 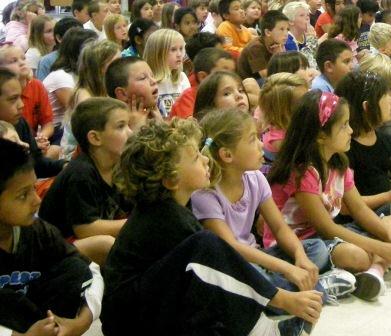 This assembly made me feel good about being a teacher." Mrs. Debbie Smith, Teacher - Gifted and Talented Education, Elizabethtown Area School District, PA.
"With a wave of her hand, visiting author Kay Winters called students, teachers, and even the principal up from their seats to be part of her interactive presentation. This delivery style made everyone understand that being an author was a matter of paying attention to the things that are going on around you. It was a delight to have Kay Winters at our school." Mrs. Rita Wingle, Librarian, Conrad Weiser East Elementary School, Wernersville, PA.
"Such a passion for writing and students made Kay's author visit to my school (Andrew Buchanan Elementary School, Chambersburg, PA) a memorable experience for all. She has books appropriate for kindergarten through fifth grade students, and the books easily connected to PA standards and curriculum. She adapted her interactive presentation to suit her audience and shared insight into the writing process and where she gets her ideas for writing. Students, parents, and teachers commented on her presentation, professionalism, and patience". Debbie Urso, Title I Reading Specialist, Guilford Hills Elementary School, Chambersburg, PA.
"Thank you so very much for coming to our school! Your presentation was fabulous and your delivery was so appropriate for all age groups! I hope your ears are still ringing from all the nice things everyone has been saying about you." Trudi Rosencrans, Librarian, Cold Spring Elementary School, Central Bucks School District, PA.
“Our school absolutely loved having Kay Winters present her magnificent books to us. Kay's presentation was very well received by the students of my school. With great audience participation, my students loved feeling like they were a part of her program. I recommend Kay Winters to your school.” Mark S. Ransford, Principal, Chadds Ford Elementary School, Chadds Ford School District, PA.
"It was such a pleasure to meet you. As far as the students were concerned, you're the best. They so enjoyed your presentation and loved interacting with you in front of their peers. The teachers were so impressed with your speaking style and your ability to relate to the students. Thank you so much for spending the day with us and igniting a flicker of love for writing." Dawn Cicco, Librarian, Ranney School, Tinton Falls, NJ. "I wanted to write and tell you how much everyone enjoyed your visit with us. You were wonderful! You are such a gifted teacher, writer and presenter. I appreciated watching the three come together as you interacted so beautifully with the students and teachers. The students and faculty are still talking about what a wonderful experience it was.” Sherri Hunkins, Teacher, Our Lady of Perpetual Help Parish, Maple Shade, NJ. "...This past Monday, we enjoyed presentations by Kay Winters, author of numerous works of fiction, non-fiction, and poetry, and whose books have been translated into Arabic, French, Italian, Korean and Spanish. Mrs. Winters proved to be a delightful and engaging presenter. Mrs. Winters' presentation, The Magic of Story, was both personal and educational. As she shared excerpts of her books with us, some children and adult volunteers joined her up front. Her teaching background clearly came through in her presentation." Kevin Dorken, Principal, Lyon School, Glenview, IL. "I'm so excited! In your assembly program you hit on exactly the things we teach about the writing process and being a writer." Ann Gross, 3rd grade teacher, Mary E. Roberts Elementary School, Moorestown, NJ. "Your visit got rave reviews from everyone, the principal, kids, teachers, and even the custodian, who made his own teeny tiny ghost from a white mop and draped it in the rafters of the all-purpose room! Your presentation was just right...the interaction, the slides, and the story sharing. It was truly a wonderful day!" Sue Mollineaux, Teacher, Kearns Primary School, Granby, Connecticut. "As I read through our conference evaluations, the participants loved the idea that you were a former teacher who really understood not only what was best for children and reading, but who understood teachers and their perspectives for what was right and true for children and literacy! So thank you for being who you are and keep on writing the wonderful books you write." Alice F. Snyder, Associate Professor of Language and Literacy; Coordinator, Kennesaw State University Annual Conference on Literature for Children and Young Adults, Kennesaw, GA.
"I am a second grade teacher at Selinsgrove Intermediate School. We loved your program! It was informational, educational, and just plain fun. I have never seen the kids applaud for books the way they did for yours. You were magical. And you are inspirational as well." Edna Cravitz, Selinsgrove Intermediate School, Selinsgrove, PA.
“Kay Winters is dynamic, enthusiastic, and well received by both students and teachers alike. Her teaching background and experiences enhance her ability to present an educationally sound and appropriate program to students of all elementary grade levels. She captivates her audience from beginning to the end. Kay's author presentation is a clear winner!“ Anne Ross, Third grade teacher, Baker Elementary School, Moorestown, New Jersey. "Thank you so much for your excellent presentation to our students and staff. Your ability to work with a large group of students of all ages was very impressive and allowed a fun experience for the children to fully participate in sharing your ideas. We prepare many programs for our students, and we all agree this one, and YOU, rank at the top! Thank you for all you did to make your visit so successful." Sandy Brehl, Teacher, and the Artist/Author-in-Residence Committee, Hales Corner Elementary School, Hales Corners, Wisconsin. "The staff and students were so impressed with your writing background and knowledge. You made writing come alive. We learned how important it is to observe life and make connections. Your 'writing words of wisdom' crossed all age levels and especially captured my heart and soul." Bonnie Rosen, Principal, Bridle Path Elementary School, Lansdale, PA.
"Thank you so much for your visits last week. I've heard nothing but great reviews from teachers and students alike. You do such a wonderful job of sharing your experiences as an author. Everyone really enjoyed your books and presentations." Lacie Wert, Tuscarora Unit Intermediate Union 11, Non-Public Schools, Mcveytown, PA.
"You were awesome. Your friend, Melissa." Grade 2 - Clinton, NJ. "You were such a hit! Everyone was impressed with your energy and enthusiasm. Many people commented on your ability to reach out and capture such a diverse audience." Nan Bryant, Reading Specialist, Winchester, VA.
"Thank you so much for visiting the Guth Elementary School. You are loved and appreciated by teachers and students alike.... Thank you for your enthusiasm and love of children, reading, and writing. From fiction and poetry to informational narrative, you seem to identify the interests of all readers. Thank you again for inspiring a wonderful Author's Visitation Day!" Melody Nichols, Principal, Guth Elementary School, Perkasie, PA.
"Your energy level is amazing. You made each group feel they were special. From pre-kindergarten to fifth graders, you deftly adjusted each session to meet the interest and maturity level of the group. You are first and foremost a talented teacher!" Betty Grant, Reading/Learning Specialist, Germantown Academy, PA.
“Kay Winters assembly program is remarkable. She masterfully intertwined humor and storytelling to captivate our kindergarten through fifth grade students. What impressed me most about Kay's presentation was her natural ability to manage the group and connect with the kids. She allowed her audience to express excitement and enthusiasm, while quickly refocusing their attention without wasting a second of time. Kay and her husband make a great team!” Steve Dissinger, Principal, Hillendale Elementary School, Unionville/Chadds Ford School District, PA.
"Your creativity and passion for writing was highly inspirational not only to your young audiences but to the teaching staff as well. I had so many teachers tell me what a great experience this was for them as well as for their students. You have planted the seed of hope that each child who experienced your talents now realizes they too have stories to tell born out of their own personal experience!" Donna Sanderson, Supervisor of Elementary Education, Upper Darby School District, PA.
"From the moment Kay Winters entered our school, her enthusiasm for literacy and children set the stage for an extraordunary day. 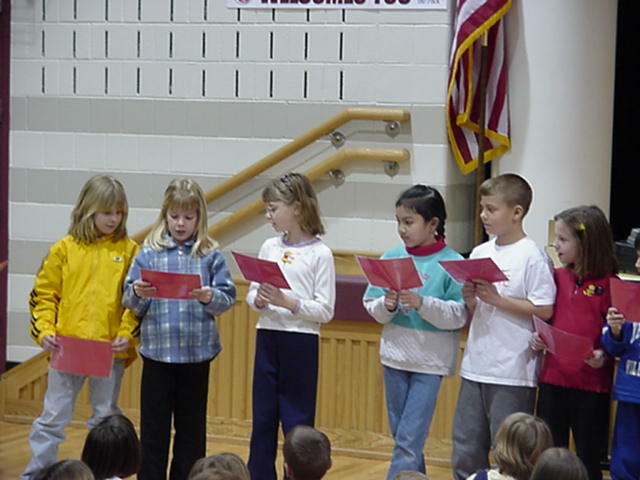 ... As a teacher, Kay understands the importance of active engagement so the students performed in poetry troupes and Readers Theater. We are looking forward to her new books so we can have her visit our school again." Barbara L. Buhrman, Intervention Specialist, Falling Spring Elementary, Chambersburg, PA.
"I have received a lot of positive feedback from the students and teachers about you and your presentation. Everyone agrees that you were our best author visit yet. Thank you!" Dana Mencel, Librarian, St. Catharine Catholic School, Spring Lake, NJ.